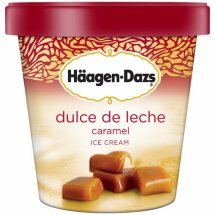 Inspired by Latin America's treasured dessert, Haagen-Dazs Dulce de Leche Caramel Ice Cream is a delicious combination of caramel ice cream swirled with ribbons of golden caramel. It features warm, caramel notes, mingling with sweetened cream flavors. Caramel Ice Cream: Cream, Skim Milk, Sugar, Sweetened Condensed Milk (Milk, Sugar), Egg Yolks, Corn Syrup, Baking Soda, Salt, Vanilla Extract. Caramel Swirl: Sweetened Condensed Milk (Milk, Sugar), Sugar, Water, Corn Syrup, Coconut Oil, Pectin, Soy Lecithin, Salt, Baking Soda, Vanilla Extract.